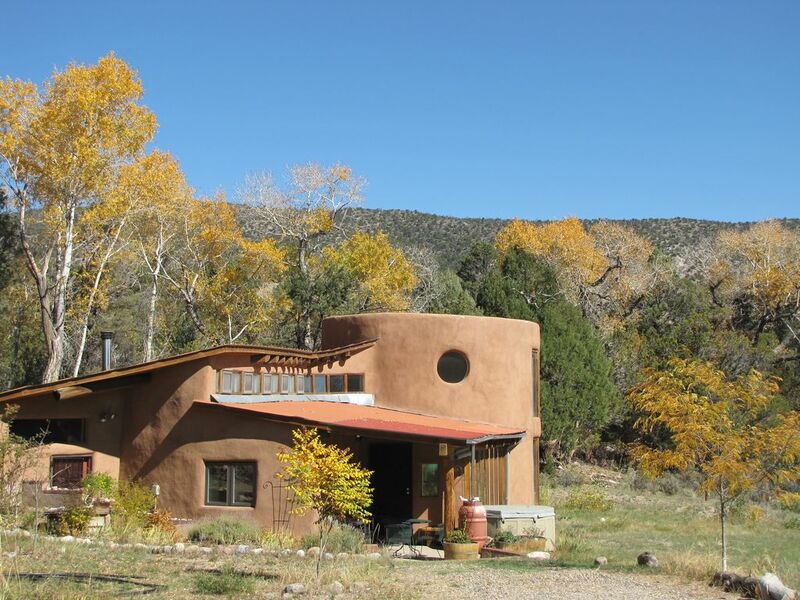 Casa Ambrosia is nestled in total peace and privacy, surrounded by tall cottonwood, pine, and oak trees, with an expansive view of the pastoral river valley of El Rito and the majestic Sangre de Cristo mountains off in the distance. This wonderful, comfortable, and serene hideaway accommodates 4-5 people. The uniquely designed passive solar adobe house with high wood ceilings and impressive vigas is spacious and filled with light. There is a large semi-circular sun room, built like a sunken kiva, that is designed after Casa Grande in Chaco Canyon. There is one bath with tub and shower and two large bedrooms, each with a spectacular view. The softly curved walls of most rooms create a calm and nurturing environment. A fireplace adds to the warmth and comfort of the radiant floor heat. And along with great indoor living and dining spaces, there is a covered patio for outdoor dining and relaxation. A newly added hot tub on the front patio is perfect for relaxation and stargazing year round. Casa Ambrosia borders the mountainous Carson National Forest and you can hike for hundreds of miles right out the back door. A short drive takes you to a creekside trail leading to Potrero Falls amidst tall Ponderous pines and aspens, or to a dramatic outcropping of volcanic upthrust near a shady stream. Nearby forest roads lead you to high mountain meadows filled with wildflowers and streams and breathtaking views, or off into desert canyonlands, with red cliff walls and towering rock formations. In winter, snowshoeing and cross country skiing are great pastimes. Year round, the very clear night sky is perfect for stargazing. The historic village of El Rito has it's own charm, including a well-supplied library, a traditionally-built adobe church, and El Farolito, a small family restaurant, world famous for its authentic northern New Mexico cuisine, recommended in the Rand McNally Road Atlas and Gourmet Magazine. Their red and green chili dishes are delicious and very reasonable. Casa Ambrosia is 15 miles north of Abiquiu, with it's stunningly beautiful lake for swimming and boating. In the village of Abiquiu, you can tour the home and studio of world reknowned painter Georgia O'Keefe, and visit the Rising Moon Gallery, bursting with high quality art by local artists. And further north in Chama, you can ride the historic Toltec Railroad through the high mountains, catching the glory of the changing colors of Fall. Casa Ambrosia is 14 miles west of the beautifully appointed Ojo Caliente Hot Springs Spa and Resort, with a variety of natural mineral pools to soak in, plenty of massage and spa treatments to choose from, and a delicious restaurant to top off an adventurous day. Only one hour to Santa Fe, and about the same to Taos, you can enjoy all kinds of fine dining, live music, museums, galleries, boutique shops, antique stores, films, opera, and much more. Both Santa Fe and Taos have ski basins, and there are several golf courses in the area. There are many national monuments and historic sites in the area, including Bandelier with it's ancient cliff dwellings and petroglyphs. Whether you're seeking cultural activities, ancient history, or natural beauty, there's something for everyone in this compelling heartland of Northern New Mexico. I grew up here in Northern New Mexico, and have spent many years exploring the wilderness areas nearby. Later I lived in exciting places like Washington DC and San Francisco. But eventually I felt called back home, and I haven't regretted it since. I find great solace in the wide open lands, vast blue skies, and I appreciate the diverse cultural history of this area very much. When I moved back to New Mexico I wanted to live somewhere peaceful and remote, yet not too far from civilization. El Rito was perfect. Nestled in a tranquil river valley, with countless trails to explore in the surrounding mountains, yet only an hour's drive to a hotspot like Santa Fe or Taos, I found the perfect balance. Years later, when I moved to Santa Fe for professional opportunities, I began renting Casa Ambrosia as a vacation home. For several years now, I have enjoyed sharing this nurturing home with it's beautiful natural surroundings with many guests, and it is my wish that many others may also experience the restorative possibilities that abound here. Whether it's getting away from a busy job, wanting the peace and quiet of this serene place for rest and renewal, or looking for new adventures out in nature, this is a great place to visit. I love the amazing variety of terrain around here, from the high mountains with their meadows, lakes and streams, to the lower desert canyonlands with their colorful cliffs and magical rock formations. And with Santa Fe, Taos, Bandelier, and other interesting places so nearby, there's never a shortage of things to do or see. There's truly something for everyone to enjoy! The bathroom includes sink, toilet, linen closet, and standard-sized tub with shower, and features warm radiant heat under the tile floors. The majestic Sangre de Cristo Mountains, snowcapped for 6 months of the year, off in the distance, with smaller hills, meadows, streams and forests all around. This is a great area for crosscountry skiing, right out the back door, and up into the forest for many miles, along forest roads, or through open country. Phone available, with unlimited long distance calling within the US. Warm radiant heat underneath the tile floors. Down comforters, electric blankets, regular blankets, pillows, sheets for summer or winter, for both the King and Queen beds. A laundry room offers a washer and dryer, an iron with board, and detergent supplies. Plenty of parking in front of the house. Towels of all sizes provided. There is good wifi at the house. The kitchen is fully equipped, with plenty of dishes, glassware, pots and pans, utensils, baking and serving dishes. Also includes microwave, toaster, blender, coffee maker, coffee grinder, toaster oven. There are two dining areas. One in the spacious open kitchen/living room area, and one in the sunroom, in front of the large windows facing the mountains and valley. There are books and magazines to peruse leisurely. There are some CDs to enjoy. There are some DVDs for your viewing pleasure. The patio offers a BBQ grill, a table and chairs for outdoor dining, and lounge chairs for hours of leisurely relaxation with a view. As well as a hot tub! On the front patio, perfect for gazing at the starry night sky. While the house is a perfect homebase for day trips and adventures in all directions, many guests find the beautiful natural setting and the peace and quiet so compelling they never leave the property. Over the years every effort has been made to assure that everything you could possibly need or want is right there, to make your stay both comfortable and enjoyable. We had a, fantastic time at this beautiful location. The owners were friendly and responsive. We loved going to Ghost Ranch and soaking in the waters at Ojo Caliente. We hope to be back! We stayed here over Spring Break with 9 and 11 y.o. kids. There was so much to do-Ojo Caliente, Ghost Ranch, hiking and mountain biking. Plus there was always the hot tub to relax in every night after being out all day. We enjoyed the upstairs balcony with a glass of wine, watching the horses graze across the field at the exact same time every day!! Plus our dog enjoyed that part too. This is a tranquil getaway for families who have had enough of coordinating camps, playdates, school, homework, work, etc.... You come here to relax, unwind and enjoy nature. Perfect trip at the perfect time for us! Plus the host is so responsive! Thank you! What a perfect peaceful getaway! We loved everything about this gem - the hot tub, the stunning sunrise/sunsets, the profound quiet. Home away from home- everything you could need. Quiet property and pretty views,. The home is very comfortable and well- appointed. Kitchen has everything you need. Bedrooms are spacious with great beds and bedding. We loved the hot tub, fireplace and the room for our family of 4 to spread out. Alicia was very gracious and hospitable. Our two weeks at Casa Ambrosia over Christmas and New Year’s were an invitation to truly step out of the busy, noisy world and into a setting of incredible beauty and peace. We got snowed in for a number of days and were delighted by the sense of timelessness, silence and comfort. The fireplace, sun room and hot tub were awesome counterpoints to the dark, cold and snow. I was glad I brought my tall boots because I still got quite a bit of walking and hiking in. I love how there can be a foot of sparkling snow on the ground, but if the sun comes out and those magnificent blue skies show up, you can comfortably be outside without a heavy coat and enjoy long rambles in the powder. I wish I’d had x-country skis! The dogs were so happy to be able to come along on this trip. They loved the warm floors and sunny spots in the kiva room, and so did their humans. We brought plenty of food and had everything we needed to prepare delicious meals. This place is such a haven for me. We didn’t want to leave! Casa Ambrosia is located in the heart of Northern New Mexico. An hour or less drive in any direction gets you to such diverse attractions as the Santa Fe Opera, skiing in Taos, swimming in Lake Abiquiu, fine dining, opera, museums, art galleries, and shopping in Santa Fe, high mountain hiking in meadows and along streams, desert cliff walks at Ghost Ranch, natural hot springs resort and spa at Ojo Caliente, ancient cliff dwellings and petroglyphs at Bandelier, and much more.